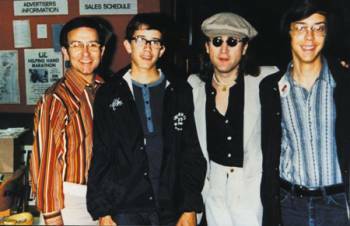 Beatles Radio Exclusive: The Story of When Former Beatle John Lennon Spent Three Days in Philadelphia. Beatles Radio: The Beatles, Solos, Covers, Birthdays, News The Fab 4 and More! On May 16, 1975, John Lennon stepped off the train at 30th Street Station, Philadelphia, and gave his old friend, famed Philadelphia journalist Larry Kane, a hug. Weeks earlier, Philadelphia’s number one music station WFIL Radio, with Kane’s Channel 6 News, began planning for their annual Helping Hand Marathon, a three day event to raise money for charitable organizations in the Philadelphia area. 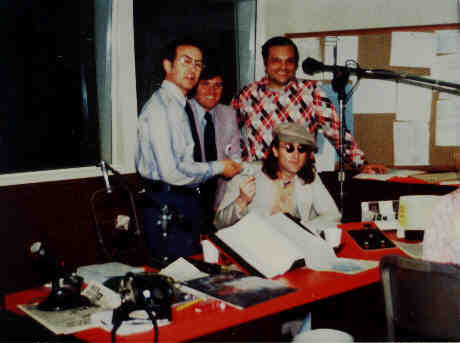 Larry Kane, a Channel 6 news anchor at the time, had been friends with John Lennon ever since he went on several tours with the Beatles as a journalist during the 60’s. Kane agreed to invite the former Beatle, whose participation would generate maximum publicity for the event. He also saw the event as an opportunity to help Lennon, who along with being estranged from Yoko Ono and struggling with the intense celebrity that came with being a Beatle, was facing deportation charges that threatened to remove him from the U.S. and his beloved adopted city of New York. 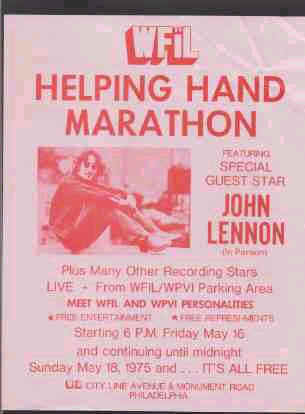 Promised letters of support from Pennsylvania politicians, Lennon spent three days participating in WFIL Radio’s Helping Hand Marathon. A Helping Hand: The Story of When Former Beatle John Lennon Spent Three Days in Philadelphia chronicles Lennon's participation in this event through the eyes of Larry Kane, Shirley Anne Lieber, a star struck young woman who volunteered for the event, and Damon Sinclair, a budding filmmaker who documented Lennon's visit. A Helping Hand features Lennon’s madcap antics, such as when he auctioned off his socks, rare audio of John Lennon doing the weather forecast on the Channel 6 Evening News, and an intimate moment when Lennon was asked what he really thought of Paul. Interspersed with compelling audio of Lennon on WFIL Radio, the three observers offer a vivid portrait of John. The whole experience is better appreciated by listening to the Audio Documentary HERE!